Located within one mile of the Los Angeles International Airport, the Custom Hotel emanates a mod, 60s style, ideal for the eclectic couple. 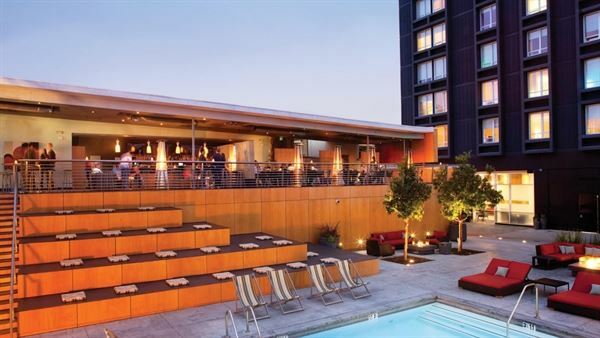 With stunning panoramic views of the Pacific Ocean and flexible event space, this boutique hotel is the perfect fit for your personal style and budget. The hotel’s Deck33 is a multi-level restaurant and bar that features a stadium sundeck, five private cabanas and a fire-pit. Hold your ceremony on the sundeck and continue the celebration with a reception inside the restaurant and bar. Your guest will enjoy the modern furniture and contemporary art found around the hotel. You will appreciate the venue’s minimalism, which allows you to reflect your unique quirks.